Here’s something so accessible to people and most don’t know… You can keep chickens in most urban and suburban settings in the United States…. With some exceptions of course. Each locality has space requirements that designate how far your chicken coop must be from all nearby dwellings (an apartment in NYC probably won’t work). Some places don’t allow chickens at all and some places just don’t allow the rooster, mainly because they’re really loud. But you only need a rooster if you’re planning on raising baby chickens. You do not need a rooster to provide eggs for your family, like we do. And oh… The eggs… Oh my goodness. When you control what a chicken eats, and how they live, and what they do, you also control how delicious their eggs are. 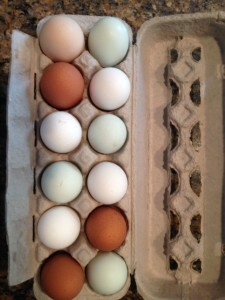 It’s not for everyone, but my family and I really enjoy having our own chickens and our own eggs. The eggs are thick shelled and have yolks that are a deep golden yellowish orange. Our chickens are a bit like our pets and have names like Judi Dench and Julia Child and Lady Gaga, and they lay eggs varying in shell color from dark to light brown, to white, to blue and green. I have a friend who is much less emotionally attached to his chickens, but he has named them nonetheless. The names of his birds are nugget, tender, cutlet, and others. 1. 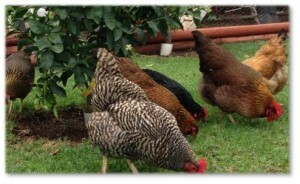 Find out what your local zoning requirements allow in regards to keeping chickens. Provided you are allowed to have chickens where you live, continue on to step two. 2. Find a resource where you can purchase your chickens. There are several resources and many are probably local to you, and especially if you are in the Northeast there are some ‘rescue birds’ available. We recently purchased some birds from Murray McMurray Hatchery in the Midwest and they ship to everywhere in the United States, I think. They have a great website and excellent customer service. We’ve bought chickens locally (in Lompoc and Norco) and they’re also great. The age of your birds is a really important factor when you buy them. Birds younger than two or three months old require a lot more work when caring for them. Chickens usually don’t start laying eggs until they are about five months old or so. Just hatched, baby chickens are adorable… But heck of a lot of work until they are about three months old. They are also a lot less expensive than older birds and most times not guaranteed to be female. Also something to keep in mind… You need at least two chickens and if you ever want to add to your flock you need to do it at least two at a time. Because of the way chickens establish their pecking order, introducing one new bird is a recipe for disaster. Chickens can cost anywhere from $2 each up to $30 or more each and it all depends on their age and the type of bird they are and where you get them. 3. Read up on how to care for your birds: what to feed them, where you’re going to buy their food and shavings and vitamins, oyster shell, etc (usually a local pet store has most, if not all of these things), and how to care for them in general. 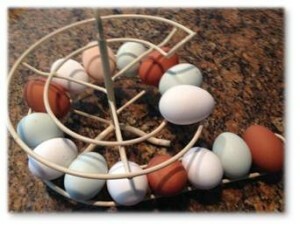 A great resource for this is http://backyardchickens.com. Having chickens IS work.. so make sure you think you are up for it before jumping in.. there is a reason there are so many ‘rescue birds’ available in the Northeast… some people figure out how much work it is and walk away from their chickens. 4. Buy or make them a coop. Lots of places have chicken coops available today, and it also could be fun to make your own out of reclai med materials, which is what we did. I say “we” loosely because my husband did every bit of the work. By using wood he found that was thrown away at construction sites and old windows from doors that people were getting rid of and paint returns from the hardware store, he had to buy a very minimal amount of materials in order to build our beautiful chicken coop. Keep in mind you want to make your coop a size that will allow your birds enough space… Consider how many birds you want and allow 3-4 square feet per chicken inside the coop… And it’s always nice to allow them to free range in your backyard. 5. Bring home your new chickens! They subsist on chicken feed, free ranging on your grass and in your yard, water, and spare leafy greens from your garden and kitchen. They also love leftover vegetable trimmings from when you cook like cucumber skins and tomato cores and half-moldy strawberries or raspberries. Half eaten bananas are very popular with our hens in this household, as well as chicken scratch which is like cracked corn. 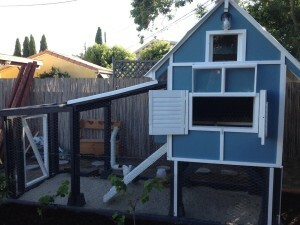 There are some ways to simplify and improve the building of your coop and the feeding and watering of your chickens. See an upcoming post in the next few weeks that will be dedicated to these topics. Love that people are jumping into the chicken game!!!! But one thing you ought to mention is that sooooo many people are taking a run at this and realizing how much work is involved then quitting. All together walking away. There are LOTS of “farm animal rescue” chickens available here in the North East. It’s not a bad idea to see about a rescue instead of buying chicks. I have an 89 acre working farm in NH now! To us it isn’t just a hobby! I love this blog and like it that you highlight there is some work involved! But, for those of us who understand there will be some effort – and have someone in our lives who can help make a decent coup – it is well worth the effort for the delicious eggs and enjoyment of having chickens! (I love their soft clucking in the evening when they roost, and love to just watch them.) My younger brother and I raised chickens when we were growing up. We lived on the outskirts of town and had 4 acres. We were very lucky. We bought 12 baby chickies, two ducks and two turkeys. Out of the 12 chickens, we had one big red rooster and all the rest were hens! Our cat got the ducks and one of the turkeys (horrible tragedy), but the turkey that survived turned into a huge Tom turkey and all the chickens followed him around like he was the mother! My dad grew up on a farm, and made our chickens a wonderful coup, though not quite as fancy as your husband’s. I remember that however the coup was constructed, it was easy to collect the eggs and clean the roost. Since the chickens were by our horse barn, dad did make a coup for them, too. Thanks again for the great blog and topic!! A wonderful story. Thanks a lot!